When you are navigating the road to home ownership it is a great resource to have a map that will show you the exact route from Credit Report To Closing. I know I have personally come across many borrowers who worked with other lenders and were never given definitive directions on the steps to take place before their loan will close. Below I will go over the 15 steps that will take you from Credit Report To Closing. If you would like to make a cross country drive without a map or PS, that is fine, but personally, I like to know where I am going. If you need help with your navigation, please give me a call at 888-900-1020 or visit my website for information or to start your journey www.loanconsultants.org. Please take the following 15 Steps from Credit Report To Closing and use them as your guide to owning your new home. Get credit pulled by inputting borrower’s full name, address, social security number, and DOB into my website (www.loanconsultants.org) If it turns out that their credit scores are adequate they can proceed to #2.2. Answer application questions from an email I will send you which we will use to determine if you are determined Approve/Eligible by DU (Desktop Underwriter).3. Once Approve/Eligible is had, collect all borrower initial documents (asset information, income, driver’s license, taxes, W-2s, etc). Once all the documents have been received and income and assets confirmed, proceed to #4…4. Upload all docs to designated secured corporate site (The URL for this will be given to you once we have everything above and verified) After documents have been received, corporate will issue pre approval to you. Once borrower has signed contract for house they wish to purchase, the signed contract is submitted to the same corporate site as provided above.5. After we have all documents and purchase contract, initial electronic disclosures will go out to borrower and once they are returned, the intent to proceed is uploaded. After disclosures and intent to proceed is signed and uploaded, the file will be presented to our Processing Department and borrower will be issued a list that they will need to submit the file to underwriting. Once we have collected the list requested by processing, we will submit them at one time, as directed by management or the processor presiding over the file.6. Clear all processor list conditions and submit for review. 7. Appraisal invoice will be sent to borrower for payment on the appraisal and once it is paid…. 8. The appraisal is ordered. If the appraisal turnaround time is greater than a week or so AND if file qualifies for a credit only underwriting, it can be submitted for review. If not, then once the appraisal is returned…. 9. Submit to underwriting. Once you have conditional approval back from underwriting, we will collect the list of items requested and once all are collected we will upload as directed by management or the processor. 10. Resubmit file and conditions to Underwriting. Once clear to close is issued, file goes in line for closing disclosure. After closing department and closing company have the numbers figured out it will be sent to the borrower. After this is acknowledged they will have 3 business days to wait to sign loan docs. 12. Documents submitted to title company. 13. Buyers now sign the documents for home purchase. 14. Closing Agent sends signed docs to corporate to review to obtain a clear for funding. 15. Funds are disbursed, recording occurs, and client gets keys. As you can see there are quite a few steps that need to happen from Credit Report To Closing. If I could suggest one thing, it would be to keep this list handy and make sure you are tracking your loan status along the way. Doing so will guarantee you a smooth closing with minimal stress. 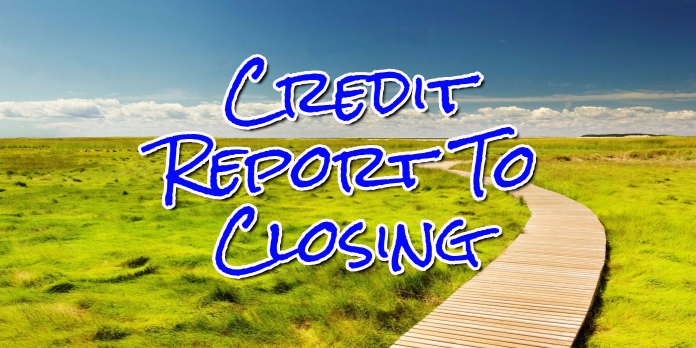 If you feel this article was helpful, please feel free to share as everyone should know the route from Credit Report To Closing.